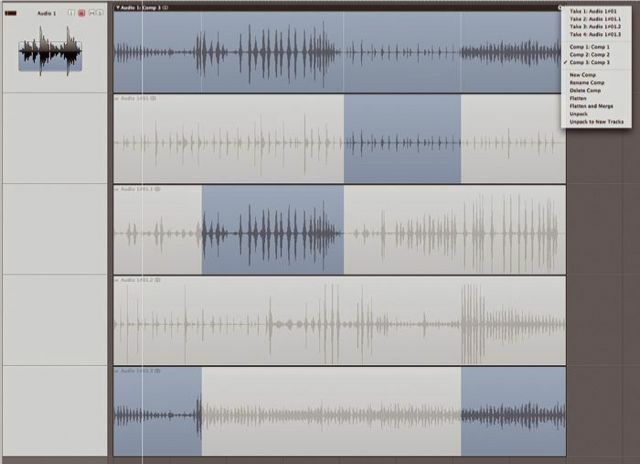 When recording something that requires a lot of takes, like a lead vocal part, you’ll want to do what’s called “comping” to really get good results. This is where you can make a composite take of multiple takes in a recording. Ever see a photographer take multiple shots and say they’ll just photoshop in the good smiles into one shot? That’s kind of what comping does for a vocal part. Isn’t that kind of like cheating? So anyway, let me move on and show you how to do comping in Logic! One thing that I’ve always been afraid of, due to how the tape metaphor often plays out in recording software, is recording over what I’m getting. I would hate to lose the perfect take by recording over it. However, to comp you must allow yourself to record over your parts. In Logic’s arrangement view, it assumes you’ll want to comp, so when you record over a part, it simply replaces the old sound with the new sound but keeps it “underneath”. You can actually fan these takes out with the little arrow on the top left of the region. Here’s where the fun part begins. Once the takes are all fanned out, you can just drag over the parts you want, and that will now be the “active part” of the composite take. For instance, let’s say the singer nails the first word of the chorus, but on the second take the rest of it was better. I can drag over that first word on the first take, and then drag over the rest of the second take and those two ideal parts now make up the final sound on the track. When I’m done, I can close the takes with the same little triangle and forget all about that part for now. This makes doing multiple takes super easy, and can make your vocals sound a LOT more professional!